HTC's new virtual-reality games are so eight months ago. The unmitigated phenomenon that was the Nintendo Wii had an everlasting effect on any medium with motion controllers: If you have hardware that can track hand movements, it needs to have its own "Wii Sports" game. Enter Vive Studios' latest virtual-reality game, VR Sports -- a lighthearted but surprisingly realistic-feeling ping-pong and tennis simulator. On March 15th, the game kicks off Vive Studios' spring lineup of VR games, which also includes a WWII defense shooter and a port of Sixaxis' virtual-reality CAD program. All three experiences are good but can feel a little dated. VR Sports, for instance, does an excellent job of simulating physics; both its tennis and ping-pong modes feel remarkably like playing the actual sport, accurately simulating ball spin and bounce. It feels natural and fun, but the simplistic gameplay reminds me of an early room-scale SteamVR demo. Similarly, Front Defense is a competent room-scale war shooter, tasking players with defending an objective while ducking behind barricades to avoid enemy fire. The concept feels a little unoriginal at this point, but the execution still has style. Players can use the Vive's controllers to grab weapons with two hands, adding stability when firing the rifle or rocket launcher. Finally, there's MakeVR -- a virtual reality 3D modeling program made by Sixense. The game was actually designed as a showcase and use application for the company's STEM motion controller, a derivative of the Razer Hydra designed specifically for VR. Unfortunately, the VR motion controller for which it was designed still hasn't made it to market, so the app was retooled to work with HTC's Vive controllers. The demo I tried at GDC today is effectively the same thing Sixense showed off in 2013, and will still export directly to Shapeways for easy 3D printing. The entire experience kind of reminded me of what VR looked like at SteamVR's first HTC Vive showcase. None of the games Vive showed off at GDC were bad, but none of them felt particularly deep, either. Still, I can't be too harsh. After all, high-end consumer virtual reality has only been around for about a year. 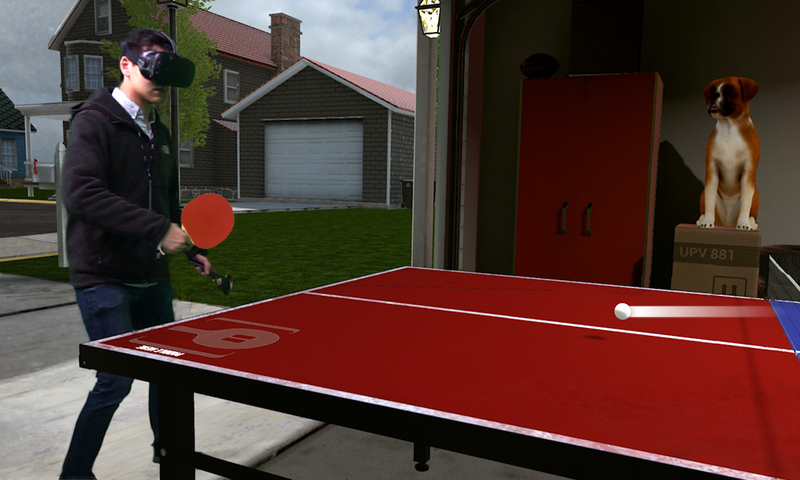 Players looking for some virtual table-tennis will be able to play VR Sports on March 15th -- and MakeVR will hit the Viveport store on the 27th. Both titles will sell for $19.99. Fans of Front Defense will have to wait a little longer: That game will hit arcade partners in April, followed by general availability in June.